For millenniums the religious have carried their beliefs with them wherever they go. They see no fault in this and have thus far had no reason to have recognised it as such. We are now living in a different time, a time when rational thought is more widespread and when what constitutes rational thought is better understood. It is my contention that religious thinkers do not think entirely rationally. As I discussed in Trial by Jury on Trial I feel that their exposure to their scriptural diktats makes them susceptible to considering problems under an imagined supernatural influence, which subsequently causes them to make decisions grounded, at least partly, in their irrational fears or favour. 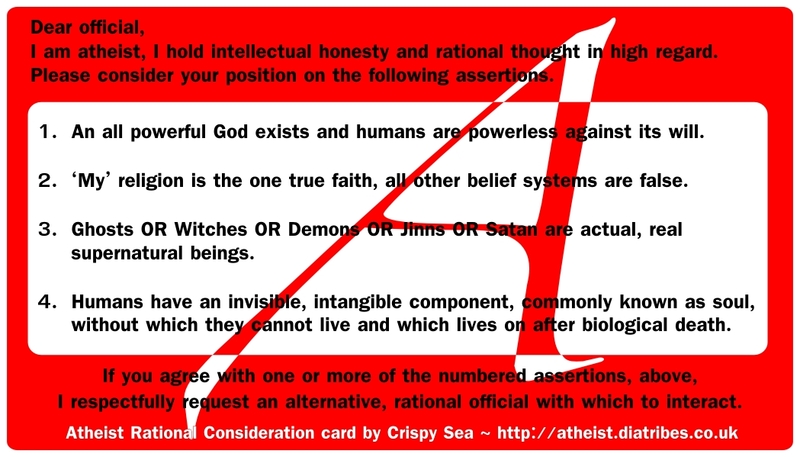 As a rational thinker, first and foremost, I hold clear-minded logical decisions higher than all other considerations and feel that this position is implied whenever I state "I'm atheist". However, it has become clear over the years that when I inform a religious believer of my atheism they often do not hear "rational thinker" but rather "devil worshipper" or "god hater" or some other doctrine-influenced perspective of my position. It has troubled me for a while that admitting my atheism to some official or other may inadvertently influence the way that official perceives and thereby treats me. As it's impossible to judge, prior to the information being delivered to the "believing" official, just how indoctrinated that official is and how strongly they cleave to the atheist-shunning, persecution instructions in their hate-book, it's impossible to gauge just how that official will view my atheism, so I've concluded that the best solution would be to attempt to take the believer's unpredictable demeanour toward my atheism out of the equation by, wherever possible, requesting a rational thinker with whom to interact. Should you choose to use the ARC card, a word of warning, be discerning in the times when you do so. For example. In medical situations you will want the best person available to treat you; use of the card in those situations may limit your choice of medical professional. The card may be of use in legal situations; in requesting a rational legal representative or for displaying your wish to have a rational Judge or jury consisting of rational peers etc. though, this is untested. 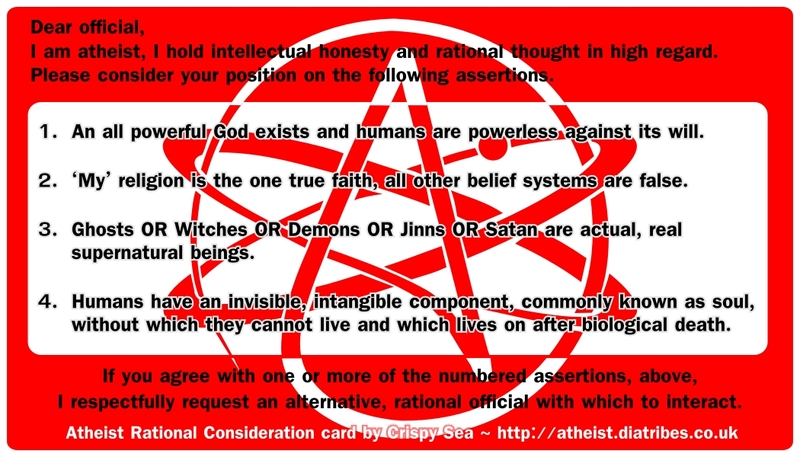 Lastly, the card is designed to display your desire for rational interaction and indicate that you consider the religious as unsuitable to fulfill that criteria. At the very least, if you keep an ARC card in your wallet, should you die unexpectedly it might just prevent some pervert priest or other form of professional witch-doctor chanting idiotic religious claptrap over your corpse, irrespective of whatever religious brand your parents had stamped on your birth certificate. Should you wish to carry an ARC card, it is free to download and print out. (To download, "Right click" and choose "Save image as" then select "desktop" or some other location on your computer to which you wish to save it. Will it be of any use to anyone? I dunno. Chimamanda Ngozi Adichie - A very fine human, leaking genius from every pore. Get yourself a beverage and put your feet up for an hour, this is totally worth every minute. Chimamanda Ngozi Adichie, thank you for thinking. Ray Kurzweil: The accelerating power of technology. Ted Talk. Dave Allen on Religion - Some of my all time fave god mocking stand-up routines. Billy Connolly ripping religion a new one in fine style. Pat Condell - as clear and concise as ever. I did not raise my children to believe "there is no god" I raised my children "in the absence of a supernatural belief"; there is an important and distinct difference between those two positions. I did not raise my children to have a positive belief in one of the ancient "god" myths, largely because I had discovered that all the belief "systems" hang their "rules for living" on the pretence that 1. There is magical power ruling over the universe. 2. The human body/brain is driven about by a ghost-like personality. The 1st fantasy is no more than an ancient philosophical conclusion to answer "how did this all get here"; this is plain from the absence of any relevant detail in any of the doctrines. Scientific discovery has replaced all the creation stories of our dim and distant ancestors. The books have been displayed over and over as incorrect. This means the books, and any god they depict, have no authority. The 2nd fantasy, especially, seems to be endemic but no more likely. The "soul" is the root cause of the books. Ancient peoples sensed that "consciousness" was somehow different to the "material" of the world, over millenniums that sense of it "being somewhat different" formed itself into stories about what happens to our "different, non-material body-part" after death. However, the evidently factual evolutionary process is an entirely material process. All human traits are evolved via interaction with our material environment. There is no way for a creature(us) living in an entirely material environment, whose development through eons is shaped by an entirely material process, to evolve an immaterial body part(soul) and then become so dependent on that immaterial part that the being cannot survive without it. No way whatever. All the books that deal with what happens to "soul" are trying to explain a concept raised by that "soul" misjudgment, that "consciousness" is magical and can survive material death, but none of the books' claims exceed a state of pure speculation and so the various claims they make are not "made". They claim a god/soul "exists" without ever displaying that a god/soul is even a possible entity. They claim as factual what has not even been proved viable. If I placed seven boxes in front of you and told you "the right life-path and the point of individual existence is in one of these boxes. Try out the path in each then choose one." the message you would receive, even before opening the boxes, is "There IS a 'right' life-path and there IS a 'point' to individual existence." Merely presenting the boxes endorses belief in a "human spiritual core" and "magical authoritarian overlord", indirectly promoting both concepts as equally likely to "no spiritual core" and "no overlord". As neither spiritual core or overlord have any basis in the evidence the most honest position is to not present the boxes. Any who would say to my children "your parents did not give you the choice; you've been raised no differently to any believer's child" are thinking religiously or, at least, thinking via a religiously originated frame of reference. They haven't realised it but they have accepted that one or more of the doctrines might be true, possibly by the adage "there's no smoke without fire" possible because they like the idea that they may have an "immortal spiritual core", possibly because things have happened to or around them that they cannot explain and seem supernatural to them, possibly a combination of these and/or other factors but, regardless of how they acquired the intellectual position, they have accepted that "reality may have a supernatural component". And they have accepted this ONLY because the religio-spiritual dogmas are all pervasive, seeping into every corner of society and touching, even if only indirectly, every human psyche. And this religio-spiritual undercurrent prevails because this world has been under relgio-spiritual occupation for millenniums, the idea that "magical body-parts and gods are real" has been bred into humans. (For more on this see Oxford-University Shame) If they had not been born into this toxic religio-spiritual oppression it's likely they'd not know of fantasy myths but it's almost certain they would not be thinking "one of the fantasy myths may be true". "Then, what's the point of life" is the existentialist question many atheists are asked, as if there MUST be a point, but why should there be? Seems to me that only those who have grown up amongst the doctrine addicts, who tout that there's a "great 'point' to life", think that there might be a point but a "point" is not indicated by the evidence. We may only assume that anyone who thinks there is a "great point" has, at some point, had their thinking compromised so that they believe that there might be a "point". As I see it, from the evidence, the only "point" to life is survival. After that it's entirely up to you what you do. Your legacy is in how the human race's future members remember your contribution to humanity's continuing progress. Aristotle, Shakespeare, Einstein etc are remembered as "great humans" because of what/how they thought. Their immortality is written into our comprehension of reality; their immortality comes from us revering their comprehensions, to such an extent that we have assimilated their observations and analysis of reality into the form and function of our society and culture. Immortality may be achieved but it is always achieved vicariously. When it comes down to it. I raised my children "human". They started off, as all babies do, as "implicit atheists" because that is the default human position, they remained untainted by supernatural faiths because I did not fill their heads with the idea that one of the "self-help", life-guidebooks might be more than groundless fantasy. I raised my children in the absence of religious belief because evidently there is no "God" for any of the dogmas to contain "the word of". I did not indoctrinate them with "you must believe there's no god" and "you must accept evolution" I simply omitted the groundless fantasy. I did this because the death-escape-pod fantasy is not merely "harmless fable" like Snow White; the concept that there's some way to "continue to experience after you've died" is an addictive concept to which humans are extremely susceptible. Religious faith is so addictive that to present the boxes mentioned above is like offering seven hypodermic syringes filled with addictive psychoactive drugs and saying "try one." The only sensible option for one who wishes to remain a "clean" human is to not inject. So what do you think; should a parent offer belief, in the knowledge of the damage it does, or not offer belief in the knowledge that merely offering it, endorses it? Is it only its complexity what has made it seem so unanswerable for so long? If we lived on a planet that was not under occupation by the descendants of a millenniums old religious breeding program(1), would it still seem as unanswerable? There's definitely a repression about the discussion of consciousness; a feeling, even amongst some atheists, that consciousness is beyond comprehension, that it is somehow of a substance "other"; an insubstantial substance that's perceived as, shall we say, "superior" to the material in which grows. I think much of the answer is in "Soul Trapped Spirit"; the widely accepted hypothesis that within the human body resides an "immortal soul" is an ancient, possibly now epigenetically embedded, misjudgement by our primitive ancestors. And out of that initial misjudgement grew fantastical fictions to explain the "dualism" we sensed, that what was termed the "immortal soul", now often compounded with the word "consciousness", was in some aspect "different" to the rest of existence. However, those fantastical scriptures mostly only detail what will happen to this "different" bit of ourselves after the "ordinary" bit of ourselves dies, there's very little, if any, detail of the substance of this insubstantial, will-o'-the-wisp, while it resides as a mortal. So, without the ancient misjudgement and its supporting muses, does it still seem so "unanswerable"? Why does humanity have "civilisation" and our animal cousins do not? I mean, that's really what we are talking about; the evidence that we are "somewhat different" is evident in our every endeavour, from our primitive ancestors scratching paintings onto a cave wall to "our" space travel but, as far as we are aware or can show evidence for, there is nothing "beyond" the abilities of the biology. Well, let's start at the top. It seems that there are no significant differences between human brains and our nearest mammal relative's thinking kit. Yeah, okay we've got some more actual mass, it's somewhat bigger, but the functions are not significantly different. If there are no "obvious" differences in brain components then we must look elsewhere for the reason for our conscious state but I'm not suggesting we look outside ourselves; as you might expect if you've read this blog before, I'm not suggesting we attribute it to pixie dust or some hairy-chinned eternal. I'm pointing only at the other components of our bodies that separate us from the "beasts". Ideally we should be looking not at differences between us and our mammalian cousins but at the similarities. There's much work going on in this field of science and Laurie Santos is showing all kinds of interesting similarities between human behaviour and complex "monkey" interactions. However, as I'm not in a position to list all the uncatalogued, possibly unknown similarities, so as to exclude them, I'm going to shortcut to the two most obvious distinctions, which define us to be "apart" from the rest of the billions of different animals. I'm sure you already know but for those that do not, these are our ability to touch each fingertip to the thumb of the same hand, our opposable thumbs, and our ability to form the complex sounds, our larynx and mouth structure which enable language. I'm sure u know the rest. The point here is, without opposable thumbs no one would have been able to make a bucket. It's even likely that our opposable thumbs provided us with enough tooling skills to allow us to manipulate fire in the first place. Opposable thumbs increase our range of movement and enable the development of skills required for fashioning tools, increasing thereby the complexity of our world view and, I suggest, for this reason must be counted as a factor in increasing the complexity of our thoughts; that opposable thumbs are part of the tools with which brain complexity is fashioned. It's been reported(1) that a human brain is about 3.6 times the size of a chimpanzee's and while that means many areas within are somewhat enlarged in comparison, there are some areas, which, since our evolutionary divergence from our nearest cousin's path, have enlarged to a greater degree. The Broca's area (Brodmans 44,45) show enlargement of 6.6 times and 6 times respectively! The Broca's area is associated with language. Now, to me, it seems irrational to assume that enlargement of areas of the brain associated with language could have developed without necessity, however, can we conversely, reasonably assume complex language led to enlargement of these areas? I think so. So, the second key component of the "fire" example above is language. Bearing in mind that Human language, of complex aural interaction, is constructed on top of natural body language, which all mammals display to some degree, consider these two events. 1. If a chimp holds out a banana, another chimp may, via body language, assume it is being offered and take it. If it was not being offered, there will likely be a scuffle. 2. If a human does the same, the banana is not taken until there is a communication and agreement, between Owner and Desirer, via body language, verbal language or a combination, that it's okay to take it. Seems simple that, even obvious, however, there's an astronomical amount of complexity in the second exchange and complexity is all in the detail. Obvious, I know but it's exceedingly apt here. Language is partly/mostly about labelling objects. And we're back to opposable thumbs; tools need labels to distinguish one from another and, for the teaching of skill with tools, labels for actions and skills are required. 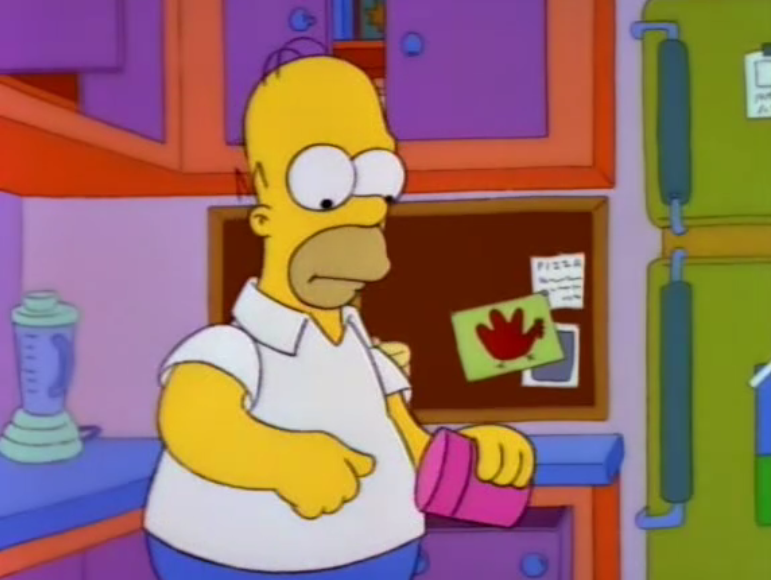 The label we give to what Homer Simpson might describe as a "Deely for digging food" is "Spoon". I know this is simplistic but the label "spoon" neatly encapsulates Homer's loose description. "Spoon" is not merely 5 squiggly symbols representing the sounds we can make; used in conjunction with each other these squiggles transmit an image, and not merely of the shape of the word but of the general shape and size of the tool, the function to which it is put most often and, contextually and indirectly, it conveys information about the materials from which it's constructed, its construction method, history, origins, other uses to which it may be put etc. All this can and is transmitted on a single utterance of "Spoon". What I'm getting at here is words are their definitions; they label, categorise and define some component of our environment for us. These definitions, define the world in which we exist. Now, take that word "definition" and apply it to optics. In this context it means an improvement of clarity, a refinement from blurred to focused. When one can see an object in more definition, one gains a greater comprehension of it. Take a Gecko Lizard's feet for example. A gecko can climb "impossibly" well; up glass and across ceilings, yet it looks no different to other lizards, so what makes it possible? When I was a kid, its ability to so easily defy gravity seemed magical. On closer inspection, by diligent scientists scrutinising via high technology microscopes, it became clear that each Gecko toe is covered with "invisible" spatulas (of a width that is just below the wavelength of visible light) which facilitate their "miraculous" ability. When I was a kid "invisible" meant "not at all visible", now "invisible" means "not visible to the naked human eye". A subtle change of definition that must be taken into account when stating that something is "invisible", one must now consider adding "by any means". Thanks to our greater comprehension, "invisible" is no longer a sufficient transmission of the properties of the object but now the word must be modified by an adjective such as "Fully" or "Totally" or a more scientific describer may detail the exact frequencies in which the object attains "visibility". Now, to "meaning"; when we define an object it gains meaning to us, like with the gecko's feet, prior to modern inspection the Gecko's ability was mysterious, post inspection we comprehend their ability and the "mystery" label is expunged. When we comprehend in greater detail, the mental image we evoke when someone says "Gecko feet" is forever adapted to include the actual reason for their ability. A memory triggered by the phrase "Gecko feet" has been stored in greater definition; we see "lizard feet with spatula covered toes that help the lizard to defy gravity"; a definition upgrade on "standard lizard feet". The word's definition and the image it transmits, holds more inherent "meaning" or, we might say, is more "meaningful". According to MD Hameroff's research our brains' micro-tubules give us 40 conscious moments per second or, to put it another way, 40 "environmental updates" via which greater definition or meaning may be gained. For an animal, which is without verbal skills, the memory engrammes of those 40 environmental updates have no labels, no definition of purpose, no defining meaning. For a human, with language, each and every conscious moment has extra clarity, definition and meaning. For a human each conscious moment is packed with exponentially more information, each snapshot of our "experience" is stored as a memory pattern that is vastly more detailed than a being without language can ever hope to store. Without language even "hope" is questionable concept. Ok, a little side step here but it's pertinent so bear with it. Some years ago, maybe a couple or three decades, I remember technologists making claims that went something like "If computer evolution follows the prediction of "Moore's law", computers will reach critical mass and become sentient within a few decades". It was these sorts of earnest predictions that added fuel to fictional works like the "Terminator" movies. As you're likely aware, their computer "sentience" prediction did not happen and it now looks like it will take multiple lifetimes rather than one, as was suggested, for any computer to achieve "consciousness". In fact it's probable that you'd be hard pressed to find a technologist making the same claim today. So, why was their genuinely made assessment so wrong? Moore's law has held up, so why are there no sentient/conscious computers? I think it's because they were assessing the wrong dataset. While their prediction came to pass in terms of computer's electro-mechanical critical mass, computing power is there or thereabouts powerful enough to simulate a "consciousness", they were assessing the material qualities of the hardware; assessing and extrapolating the number of chips, computing speed and memory etc. They couldn't have been expected to realise it but maybe they should have been measuring the critical mass of the software's complexity and data quality. Similarly with our brains, may we not assume that "consciousness" is an emergent property that does not emerge directly or solely from the critical mass of the physical components but from the the quality of the data management systems, the quality of the data, the internal interactions and links between physical components, and external interaction with other thinking beings who assist us in defining labels, for further internal correlations and parallels to be observed and catalogued. Can we not speculate that consciousness emerges from the need to survive in an environment that includes the requirement to interact "reasonably" with each other, our group, tribe or society? Can we even begin to ask the question "how does consciousness come about?" by looking only at a single brain in isolation? I mean, our DNA was not formed in isolation; we are a group based organism. Should we maybe therefore look for part of the answer to the consciousness question in examining the contribution of the "group-think" from which it is spawned? I think we should, however, I also think it would take a costly and lengthy study to discern any solid conclusions. Instead then, as a little sociological, if ancient, clue consider "The Dreamtime", ancient Australian Aborigine legend. Seems to me that the Dreamtime "details" pre-modern human comprehension but I don't think it details human comprehension of "the world", rather I feel it displays the emergence, within that human collective, of modern human consciousness. If we were without formal language, all our thoughts would be "imagery"; like that of a dream. Indeed, I suggest, to non-sentient, pre-sentient or cusp-sentient mammals, the waking world and dreaming world must seem fairly indistinguishable. Remember, it would be impossible to think "No, that wasn't a memory, that was just a dream!" and not only because language is absent from one's experience but also because it's likely that there would be a similar sense of "reality" in the dreaming state as in the waking. It's likely the difference would only become clear between dream and reality when the beast that's chasing you catches you; if you were dreaming you'd wake, if you weren't you'd get eaten. In fact, if you think about it, dreams quite often seem real to us and it's only when a character in the dream says or does something that defies "reason" or would not fit with their "real life" abilities, philosophical or physical, that we are tipped off that it's a dream. As it's quite clear from the art they've left behind the early aborigine had opposable thumbs, their tooling abilities, within their environment, can be said to be virtually indistinguishable from our own. Is it not therefore acceptable to conclude that the only difference between their Dreamtime and our current state is complex language? And maybe deduce from that, that it was a lack of labels with which to define and comprehend their world that prevented them sufficiently distinguishing it from dreaming? I think there's reason to consider the Dreamtime as an evolutionary footprint on our path to modern consciousness. As tentative evidence for the hypothesis that consciousness emerges from a critical mass of definitions, think of any child you know; you were one once, think of then. Do you remember making any rational decisions before you were seven years old? I know I don't. I think this is because up until a child's about seven they are solely instinct driven; in my experience a child's "rational self" usually starts emerging between seven and ten years when the tantrums "to get their way" diminish in favour of reasoning or conniving. To answer "why that is the case?" I feel we may look only to language. It's very tricky to "reason" with a tot, they're "listening" but not only does their instinct to "Want it!" override them hearing you, they also cannot fully comprehend "reasoning"; there faculties of reasoning are severely limited by their incomprehension of vocabulary, grammatical structure, inflection and body language etc. So, as our experience shows, one can "reason" with a ten year old, could we not say that the child achieves "consciousness" only when it has assimilated sufficient definitions to enable the making of rational assessments? A new school is built but then, because of government spending cuts, the governors cannot employ a full staff and the school must open without a Headmistress. For the first year of its working life, the school functions with whichever teacher is available, taking turns at being the Head. At the end of the year each teacher has tried out the Head's job but it's clear that one, Miss Esme Mee, listens very closely to the experts in her staff but also has the aptitudes and skills best suited to make the tough decisions required of a Headmistress and she takes up permanent residence in the Head's office. Doesn't a child's development loosely mirror this model? The child spends the first few years of it's life testing it's systems, trying out personalities, emotional states etc. We are all aware of tantrums, I think we can say they are instinct and emotion driven and we are all aware of the more sensible moments when the same child is responsive, interactive and even, occasionally, amenable. Over the period of about seven years the child stores up definitions, defines a focus for its environment, catalogues masses of detailed data and cultivates thereby "expert systems", which we could call personality traits, to cope with its varying environment. By seven-ish one of these expert systems has emerged as the "most useful", "best suited" or "most adaptable" etc and takes up permanent residence in the "Head's office". This expert system has one purpose, to assess the meaning of all the meanings, to make rational sense of what the still functioning but now subordinate, other "expert systems" have highlighted as "meaningful". Could this "awakening" be said to be the time when we each start to harness our primitive animal instincts and begin our journey in full adult sentience where we are conscious of our consciousness? I'm not suggesting the development of opposable thumbs and language are "the" answer to "why are we conscious? ", or am I? Maybe I am; if opposable thumbs and complex language are the major differentiators between ourselves and our nearest animal cousin then maybe they are ALL that is required for consciousness. If the first mouth-shape mutation that provided the ability to form sounds of modern complexity, possibly prompted by dietary differences between us and our nearest cousins, set the evolutionary vector of human mouth/larynx-shape, and enabled thereby, a greater use of speech, which in turn created an influx of new labels whose accommodation and assimilation necessitated the Broca's area expansion then, as with most beneficial mutations, ALL the social group's offspring, even those without the beneficial mutation, would begin to receive from their parents, and those peers who do have the mutation, new labels with clearer definition, and each new generation of children would receive a greater definition and clarity and, as a consequence, live in a more meaningful world. Could it be that the excessive enlargement of the Broca's area, though classed as an evolutionary specialisation in itself, is actually the residual evidence of an evolutionary physical mutation? I think that case could be made. Could it be that a random beneficial mutation of our speech-furniture is the cause of our diversion from chimp-like society and ultimately, the root cause of consciousness? For want of a mutation a larynx modification was lost. For want of the larynx modification the new mouth shape was lost. For want of the new mouth shape the word was lost. For want of a word the lexicon was was lost. For want of a lexicon the brain enlargement was lost. For want of a brain enlargement consciousness was lost. And all for the want of a laryngeal mutation. However, whether opposable thumbs and language are solely responsible or not, I feel they are at least important, if not vital scaffolding that allows a brain to become conscious. And if that IS the case then is it not safe to assume that without those physical properties consciousness cannot exist? If it is such, that the evolution of opposable thumbs and language is required to develop a consciousness, is it not ridiculous to claim an "immortal soul" can be formed without them as a substrate on which to grow? And further, if a physical substrate is required for the development of a consciousness then must we not consider that claiming "a god can exist apart from the physical universe" is entirely opposite to our experience and thereby consider it to be merely the folly conjecture of the wishful? Finally, if we can hypothesise that sentient consciousness can be explained as "emerging when a species with language achieves a critical mass of "quality" conscious moments", as I have attempted here, is it not proper to assume that those who guess our bodies are being driven about by something extra to the ordinary, the fabled immortal soul or spirit, like some "Casper the friendly chauffeur", are doing so solely to gain the dream prize of a death escape pod? Free will in a material universe - A Superposition Of Quantifiable Causality. Vicky Pryce, the ex-wife of the disgraced cabinet minister Chris Huhne, faces a retrial next week over perverting the course of justice on the grounds of 'marital coercion' in her taking of his speeding points. The eight women and four men of the jury panel deliberating failed to reach a verdict after suffering what the judge described as "absolutely fundamental deficits in understanding". Apparently the Jury sent a list of questions to the Judge, one of which referred to whether religious considerations should be taken into account in their deliberations! "Would religious conviction be a good enough reason for a wife feeling that she had no choice, ie she promised to obey her husband in her wedding vows and he had ordered her to do something and she felt she had to obey? I find it astonishing that one or more of the jurors thought it mattered enough to consider! I can't tell what motivated the question; whether or not the juror(s) was acting from her own oppressed experience, but does it not at least suggest that one or more of the jurors were 'expecting' religious privilege to 'count for something'? Or maybe had an awareness that religious privilege 'may' count for something, when considering the facts of a case! Is it troubling only to me that a juror may have these 'concerns'? That a juror may consider it pertinent? I understand that the question may have been asked because of knowledge that a man can pull the God card any time he chooses and the wife, as the second class citizen these religions deem her to be, would have to obey, but isn't that worse? Doesn't that only highlight a widespread knowledge of the subjugation of women, within all religiously based societies, and the widespread acceptance of that subjugation? Acceptance to the extent that the juror considered that the court system may wish to continue that abuse (or privilege depending on their own viewpoint)? Fortunately, the judge poo-pooed it but a more religious judge may not have. The judge said the question was not for this case. And Pryce had not suggested any such reasoning was behind her decision to take the points. As I see it, there is an inherent assumption of coercion from "somewhere" within the "does religion matter" question, assuming that if the husband had invoked 'the god clause' that would mitigate the wife's actions. But in that case, would it not have been her god that was applying the pressure via it's rules? And is it the husband's fault for 'believing'? Or the wife's for 'believing' similarly? Or fault of the text to which they both cleave? Or of society, for not making it clear that the law of this country is above any mumbo jumbo hokum religious text? How is it right that a juror could consider it so important, when it was clearly never mentioned in the court? Doesn't the mere presence of the jurors' question point to a troubling religious influence in places it should not be? I think so, and I think this is a prime example of the sort of religious influence highlighted in "Trial By Jury On Trial"
Fair warning here, the content of the story I'm about to highlight are distasteful in the extreme. It's foul and nauseating and disgusting and all those prerequisite words of revulsion, with which I entirely agree, but it's also troubling on a censorship level. Like I said, you'll know the story if you've been on a social network, however, if your only source of news is the BBC website/BBC TV news, you will have different words for this heinous crime by this primitive Muslim savage. The BBC are reporting it as a "beating"! (BBC News online report.) Hardly any mention of the method by which this member of the "religion of peace" destroyed his little girl. I understand that the BBC has a duty to not unnecessarily inflame this country's members of cults but to so drastically diminish this sickening murder? Isn't that just hiding political correctness behind the word allegedly? Isn't that an act of irresponsible censorship? Isn't placing the fear of incurring Muslim 'displeasure' above my right to know the facts, only indicative of the Muslim tradition of burning and bashing that which offends their cult? If members of a religion, social group, political party or what-have-you, act or appear to have acted in a way that I may find abhorrent, I want to know about it; I want to be aware of the likely threats within my nation's boundaries. Surely, the BBC's reporting here can only prohibit my comprehension of the actual situation; prevent me from forming a balanced view.? How are half-truths and omissions helpful to social cohesion? This story is about two morally reprehensible abuses of Lama, firstly by her Muslim father and his religious and culturally twisted values but then again by the Islamically spawned culture of the state in which she lived, when the Saudi Arabian sharia law system spat on Lama's memory and right of justice. This story is about the dark evil of Islam, the misogynistic, humanity diminishing, cult of Mohammed and the way 'his' lies assist his book's evil acolytes and sycophants. This is not merely about a "beating"! Surely, as a free UK native, I have the right to know ALL the facts, so I can decide for myself the values of those those who affiliate themselves with this medieval cult of hate? As a final thought here - is this about oil? Can Saudi Arabia get away with such abuses of human freedom because western governments are addicted to the energy under their sand? If it is,(probably is) I personally would rather forego the oil, let the lights go out and live in a cave rather than support the proponents of this wretched tome. It's exactly these sorts of legal decisions that prompted me to write "Trial By Jury On Trial"
UK Scouting has launched a survey to ask whether an alternative version of the Scout Promise should be developed for atheists and those unable to make the existing commitment. Full details of the changes and a link to the (unnecessarily complicated) survey is at Scouting.org. The survey queries the necessity of a 'special' version of the scouting promise for the non religious, as is currently available to potential Woggle wearers of the Muslim or Buddhist brands of dogma. I thought I'd offer my thoughts. As you might expect, I find this wholly abhorrent. This change, and all other "special measures" taken by those wishing to seem more secular, identifies difference instead of encouraging unity. As far as I'm concerned there should be only one oath/promise and only one set of laws that apply to all. A Scout is honourable, truthful and reliable. A Scout is loyal to the Queen, his/her Country, his/her Parents, his/her Officers and to comrades high and low. A Scout is helpful to others, whatever it may cost him/her. A Scout is a friend to all and a brother/sister to all Scouts. A Scout is courteous to all. A Scout is obedient and follows orders from his/her Parents and Officers promptly. A Scout is cheerful and takes trouble with a trusting grace. A Scout is self reliant and a good steward of his/her possessions. A Scout is upright in his/her conduct. A Scout is honourable, truthful and reliable. A Scout is loyal to honourable, truthful and reliable comrades high and low. A Scout is obedient to the honourable, truthful and reliable and follows orders promptly. A Scout is upright in his/her conduct. As I see it, identifying difference is the way of the past; it's ancient, embedded tribalism trying to poke its snotty, medieval nose into, what could be, an extremist free future. To achieve a promise that promotes unity, one must omit any and all preconceived differences; use a wording with which all can identify and thereby feel comfortable repeating. Thanks to Brian Pearce of Secular Wales for the heads up on the Secular Society's article on the topic. Thanks to @OneTallShadow for the heads up on this. I need only wholeheartedly agree with her note to me about "The Rap guide to evolution." " I'm not a big Rap fan, but this guy is great! "